Over the decades MUDs evolved from their mostly solo-friendly roots to the first generation of MMORPGs (Meridian 59, UO, EQ, etc.) where group play was not only encouraged but quickly became a necessary component to leveling up characters and gaining the best gear. More recently, the genre has further evolved (or devolved, in many peoples’ opinions) to where solo-play to level cap is not only possible but can be the most efficient way to do so when one factors in the leveling time that is “lost” when players seek a group, getting that group organized, choosing the right targets, etc. Additionally, when you also factor in things such as “ninja looting,” at times seemingly endless debate about tactics, targets, etc., solo-play becomes an even more appealing behavior. Dark Age of Camelot certainly was a pacesetter in establishing this trend since back then, we specifically wanted to make the leveling grind less rugged than in Everquest for example, by decreasing the amount of time people needed to spend between fights, no long boat rides, etc. Finally, as games that are more recent have blurred (or shattered) class distinctions, grouping within MMOPRGs is probably at an all-time low, especially for players who are not part of guilds or the like. While many players have enjoyed this change, especially at the beginning of this rather slippery slope (for example, I’ve always been a solo player), one of the things that I have been pondering over the years is what has been lost because of these changes. IMO, for the purposes of this FP, it boils down to two words, community and Community. I’ve already talked about the role classes will play in CU so I won’t reiterate that now but rather, I’ll address how both the crafting/housing systems and other group activities can help nurture and foster both types of community. Over the years, I have both written and spoken about the use of community and Community as non-interchangeable words. Here, I will use the word Community to refer to the current supporters of what will become CU’s core players if our Kickstarter successfully funds. While these Foundational Principles are the first step in helping to build a Community for CU, they are simply good first steps as the building of a true Community will take more time and effort than my simply waxing poetic about the MMORPG we hope to create. However, when taken as a whole, these FPs, my interviews, talking/interacting with players on forums has already created a small but energized player base with a number of players already setting up fan sites, helping spread the word about CU on forums, guilds talking about the game, etc. The best part of this for me is that while they are helping to build our Community, small as it is right now, I have also been getting gathering of useful feedback, suggestions, etc. that have been quite helpful in both validating my vision for CU and exciting the CSE team. While these methods aren’t forced on the players in the same manner that long boat rids, lengthy downtime between encounters, etc. were in certain MMORPGS, the results are quite welcome and similar; we have a group of people who are excited and working together to help us accomplish our goal, bringing CU to life. Again, this Community may be small in numbers now but if our Kickstarter successfully funds, its contribution in helping to spread the word about CU will be anything but small. No matter what the outcome of the Kickstarter, this Community has my thanks and gratitude for the efforts that have made on our behalf whether in spreading the word or simply interacting with each other and me on various forums. If we now turn to the word community and view it as a microcosm of Community, we would do it in a manner where each realm on a server could be considered a community as would the crafters on a specific server or even that all the crafters in the game could be considered a large community or smaller Community. If these players become as excited about their realm, their class and their server as our supporters our now, that not only makes the players’ time in CU both more enjoyable and meaningful, it also helps to build all the “Prides” that are such an integral part of this game’s success. It is thus of paramount importance to ensure that the smaller communities in our game also have this same sense of belonging to a group(s) and that they derive benefits for doing so regardless of their class, realm, server, etc. In an RvR-focused game like CU, if players of each realm really experience Realm Pride and get to know and care about their fellow realm-mates, these same players are less likely to engage in such RvR-breaking behaviors such as kill-trading, keep-trading, etc. which not only help shatter immersion but also spoil the enjoyment of their friends and realm-mates. Thus, part of our job as the designers and developers of CU is to put systems in place to create interdependency that encourages players to work together so that they not only have the most fun but also enjoy the quickest ways to success within the game. In terms of the crafting system, we want to build this interdependency not through creating a chain of required players (gatherers -> refiners -> builders) because that could lead to its own problems if one link in the chain is damaged/broken but rather to set up crafting goals and tasks that both encourage and reward group cooperation. At the same time, that system cannot prevent players from completing some of those actions if the requisite number of players are either not available or are simply unwilling to help their fellow crafters when requested. We will also create interdependency between the crafters and the non-crafters through the use of objectives that will require the help of non-crafters to secure, such as the special crafting stations in various structures scattered throughout the world, rare and precious metal deposits, etc. 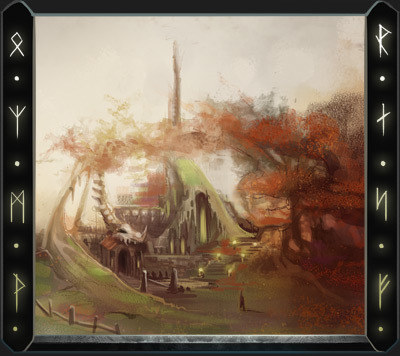 Along with the whole “no gear drop from PvE NPCs” principle, the same RvR-players who can go out into the wild and secure these objectives will also need the crafters to fulfill their gear and item needs as well as their help in building and fortifying structures. This interdependency is certainly a fine example of how forced socialization and grouping can work in a modern MMORPG in a manner that doesn’t seem strained and/or forced but flows a bit more naturally from both the IP’s perspective and the game’s design and principles. In terms of housing, which I really should rename “building” or something more appropriate as housing conjures the vision of simply building houses, picket fences and dogs happily yapping in the yard, we also will encourage interdependency. Much like the crafting system, players who engage in building structures can and should cooperate with other members of their realms to get the best results more quickly. Structures that are geared to battle will require both crafters and non-crafters working together to build them rapidly as well as to make them as powerful and assault-resistant as their crafting abilities allow. Let us say you want to build a nice beachfront house (my RL personal favorite) on a realm-controlled island because it has the best views and you are hoping the market will appreciate so you can BBD it down the road (just kidding). In order to accomplish this, your realm will first have to take control of the island and then crafters will have to come out and build the house unless you truly want to take the time to build it yourself. Now, if you are a crafter, you can build the entire house by yourself but if you can recruit some fellow crafters to help you in your endeavor, not only will your team complete the house more quickly but they will gain certain benefits by helping you as well. The same holds true for building structures out in the RvR-areas that your realm has captured and is trying to fortify against a counterattack by the other realms’ forces. If you and your fellow crafters and non-crafters can build up the defenses, there is a better chance that you will survive the coming counterattack(s), hold the structure and reap the benefits for doing so for both yourself and for your realm. These examples are literally the tip of the iceberg (hmm, iceberg, titanic, MMORPG, bad word association) when it comes to how we are going to encourage players within a realm to work together to accomplish their goals. Whether it is working together at a crafting station or fort, trading goods with other players, having well-defined class roles within a group and other such design elements, we want our players to get to know their realm-mates and by working together to in turn foster a true sense of community and Community. I believe that by truly doing so we can bring back an element of earlier MUDs and MMORPGs that the preceding years have greatly diminished.